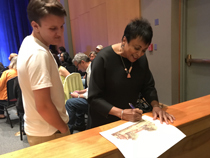 As she prepared to take the stage in the Commonwealth Auditorium Friday night, Carla Hayden was approached by a fan. He asked for her autograph and then asked if she had ever touched the Constitution. “Well, the draft,” she said. As the 14th U.S. Librarian of Congress — and first woman and first African-American to hold that role — Hayden is considered by many as something akin to the Mick Jagger of librarians, and that status showed during her visit to W&M. 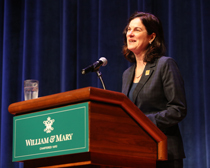 One audience member wore a Hayden T-shirt, and even W&M President Katherine A. Rowe expressed her fandom. “I feel like I’m introducing a rock star,” Rowe said. Referencing Hayden’s work with Baltimore and Chicago’s libraries and her time serving as the president of the American Libraries Association, Rowe said that Hayden has led the way in the nation’s understanding of how libraries are critical to diversity, inclusion and democracy. Hayden spoke to more than 300 people at the event, which was sponsored by W&M Libraries and a part of the university’s 100th anniversary celebration of coeducation. Throughout the 2018-2019 academic year, W&M is recognizing the anniversary with a series of special events, including Women’s Weekend, which was held Sept. 21-23. Hayden, who received an honorary degree from W&M last year, began the day by having lunch with the staff of W&M Libraries, including students. At her public talk Friday night, Hayden discussed the role of libraries today and the changes she has seen throughout her career, including a greater understanding of different types of literacy and an openness to different types of literature. “People read differently, and we need to make room for that,” she said. Libraries remain popular today — outnumbering McDonald’s about eight to one — and are as important as ever, Hayden said, referencing the new book Palaces for the People. Libraries today offer childcare, job search assistance, computer classes and more. Some libraries even offer such things as a culinary literacy center, entrepreneurship center and business incubator, fishing pole rentals, homeless outreach programs, autism resource center, a virtual supermarket and a professional social worker on staff. Transitioning to the Library of Congress, Hayden discovered “almost an embarrassment of riches,” and she has had multiple “pinch-me moments” along the way, she said, including an opportunity to read Frederick Douglass’ papers and see his feelings about the death of Abraham Lincoln reflected in his handwriting. Douglass was particularly angry about the fact that people of color, whom Lincoln had done so much for, were not allowed to pay their respects when he was lying in state. Soon after that happened, Hayden, a native of Illinois, was able to go home and see the Lincoln library and museum and walk past the re-creation of his lying in state at the capitol. During a Q&A at the end of Hayden’s talk, Aria Austin ’21, a government major and English minor, asked Hayden how to keep people reading. Don’t make reading a chore, Hayden added. “Let them read if they want to read on a tablet or read Manga or read whatever — let them read,” she said.